Every man should have at least one good drinking story. A grand vignette, told with an older/wiser élan about how, say, that one time after the Bears game you took a swing at your neighbor’s dog, which totally never happened to anyone writing this. 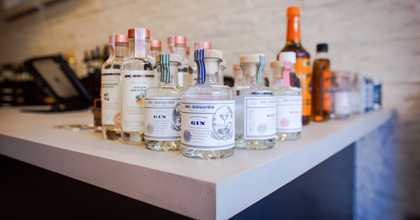 And so, if you enjoy a good drinking tale, or simply want to drink more often so you’ll have more stories, then you’ll appreciate Ezra’s, the new Lincoln Park spirits emporium. One, they sell small-batch liquor in store and online. Two, they publish the stories behind your favorite adult beverages in The Swill, a digital mag for the drinking man. They’re kinda’ like the Mr. Porter of alcohol. Beyond the stories, Ezra’s stocks beer, wine and hard-to-track-down bottles at their brick-and-mortar shop. We’re personally big fans of Balcones 1 Texas Single Malt, reasons for which there’s a story worth telling. But we’ll save it for next time.